Marinate the chicken pieces in yogurt, ginger-garlic paste, green chillies, salt, chili powder, cumin powder,all spice powder for 1 hour. Boil rice with 1 tbsp salt and whole spices till half done. Peel and cut potatoes in halves. Soak in a pinch of yellow food color in two tbsp of water. Heat oil in a pan, add marinated chicken with 1 cup fried onion and cook till tender. In a pan layer half of the rice, cover with chicken mixture, then potatoes, 1/2 cup fried onion, chopped coriander and green chillies. Now layer the remaining rice on top. Then add yellow color mixture, cover tightly and steam on very low heat for 15 minutes. 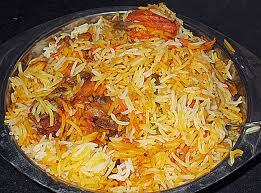 When done drizzle kewra essence on top, delicious Bombay Biryani is ready. Serve with fresh raita and salad. Take milk in a pan and heat it. Add cream and sugar in it and cook them for a while. Dissolve gelatin in half a cup of cold water. Leave it aside for a while. Now add gelatin mix in the milk mixture. Now take out mango pulp, blend it well. Add this blended pulp in the milk mixture. Mix all the ingredients well and cook them for a while. Leave them aside and let the mixture cool down. Add the mango cubes in glass. Then add milk mixture in it. 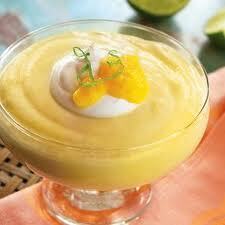 Serve your mango mousse with wafers. 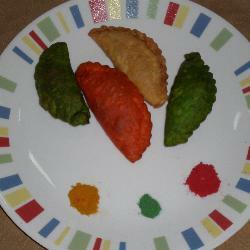 Mix food color and ghee in maida. Add water and make a dough. Mix the remaining ingredients in a separate bowl to make the filling for the gujiya. Roll 4 inch wide puris and add 1 tablespoon of the filling mixture in the center of the puri. Dab water on the edges of the puri and fold it in half (like the letter "D"). Let the puris dry for about 10 minutes. Once dry, deep fry the gujiyas on medium heat.